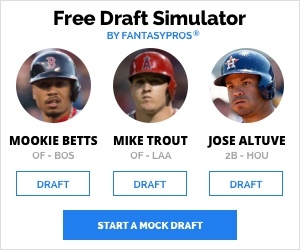 Fantasy baseball 3×3 is back again. This week, we’re catching Big Erv, resisting the impulse to trade Paul Goldschmidt, and grabbing a spot on Waveland Avenue for Travis Wood’s next start. It’s fitting that Tony Cingrani would be sent down right around graduation season; you should treat him just like you treated your girlfriend after you graduated from high school and headed off to college. You can’t shake the memories of that 11.18 K/9. But it’s over. Sure, there’s a chance you’ll run into each other some time down the line, but for now, there’s no benefit in being loyal. It’ll never be as good as you remembered it the second time around; that deceptive delivery won’t make your heart flutter quite so much once you’ve already seen it. I know it’s hard, but it’s for your own good. There are plenty more fish in the sea. If you look up the term “sell-high” in the Oxford English Dictionary, you’ll find the following entry. 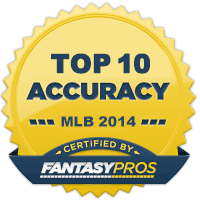 Guthrie’s 2.28 ERA is 25th-best among qualified starters. His 5.55 FIP is fourth-worst. He’s been quite a lucky fellow through his first 8 starts. His .256 BABIP is well below league average; it drops to an even more favorable .207 when Guthrie allows runners to reach scoring position. Knowing that, it’s no surprise that only one out of every 20 runners to reach base against Guthrie has come around to score. His luck is bound to change for the worse and Guthrie’s his complete inability to miss bats at even a league-average will compound that negative regression into a catastrophic decline in ERA and WHIP. 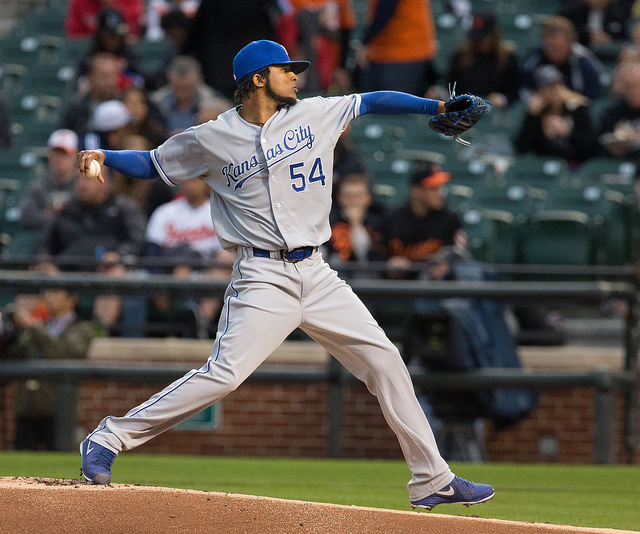 If he continues to throw this many hittable strikes, he’s going to pitch his way right out of the Royals rotation. Sell if you can. If not, feel free to drop him now. Yeah, yeah, yeah, a .193 BABIP and 83% strand rate make Travis Wood a prime candidate for a healthy dose of negative regression, but that’s not what I’m most concerned about. In 144 innings last season, Wood allowed 1.44 HR/9 and a 12.7% HR/FB rate. 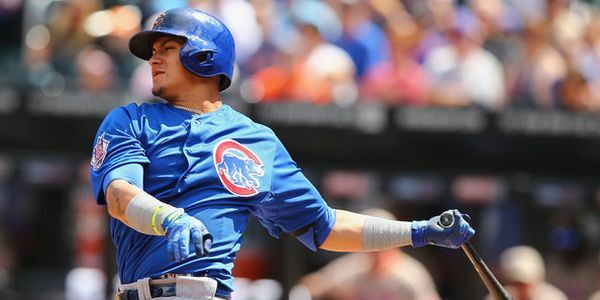 Through 53.1 innings this season, he’s cut both rates in half, giving up only 0.68 HR/9 and a 6.1% HR/FB rate. I realize that Wood wasn’t that homer-prone in the first two seasons of his career as he was in 2012, but he pitched differently back then. Over the last two seasons, he’s significantly decreased the use of his 4-seam fastball in favor of a cutter; wouldn’t you know it, that cutter allows home runs about 25% more often than the 4-seamer. I’ll always be skeptical of a fly ball pitcher who plays his home games in Wrigley Field, especially when that pitcher doesn’t have the ability to reach back and get a strikeout in a tough spot. Did I mention that Wood’s career strikeout rate is 20.9% with the bases empty and only 14.4% with men on base? As the weather warms up in Chicago, I expect Wood’s numbers to move closer to those of last year’s second half. You know, the second half when he allowed 1.63 HR/9 and sported a 5.03 ERA. Don’t look now, but Lance Berkman is doing Lance Berkman things again. He’s walking 17% of the time, striking out significantly less often than that, and producing runs for the best baseball team in Texas. After an injury riddled 2012, this year’s Lance Berkman looks a lot like the 2011 model. You know, the one that clubbed 31 homers with a .959 OPS and a .301 batting average in St. Louis. I don’t think he’ll quite match those numbers in his age-37 season, but the Texas heat and his full-time DH gig should conspire to get him pretty damn close. Berkman’s average will slide a bit as his BABIP eases down by 20 points or so, but positive regression in his 7.1% HR/FB rate (it will probably double) will balance out his overall value. If you’re lucky enough to play in the 38% of Yahoo! leagues in which Berkman is still available, scoop him up now. You’ll have to keep an eye out for any series that send the Rangers to NL ballparks, but you’ll grab about 325 plate appearances worth of fantasy goodness. Unlike his deservedly maligned teammate, Ervin Santana has earned every bit of his sparking 2.77 ERA. He’s displayed the best control of his career, dropping his walk rate to a career low 4.1%, while posting his best strikeout rate since 2008. Santana has never lacked swing-and-miss stuff; his issue has been throwing enough strikes early to set up his devastating slider. This season’s improved fastball command has put Santana in more pitchers counts, allowing him to rely more heavily on his best pitch. Hitters are chasing 32.1% of Santana’s offerings out of the zone; his career average is only 29.7%. Santana has always been a bit homer-prone, that hasn’t changed, but he’s mitigating that the negative impact of that tendency by generating more grounders and fewer fly balls, along with limiting the number of baserunners who get to ride home on the homers that he does allow. He hasn’t suddenly turned himself into a Cy Young contender, but Santana will be more than useful over the rest of the season as a solid source of strikeouts with a surprisingly palatable WHIP and ERA. 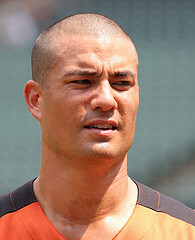 Do you really need a good reason to have a guy named “Gerardo” on your fantasy team? I mean, other than this? Given the numbers he’s put up over the course of his still young career, the only reason not to consider Parra is his chronic struggle for consistent playing time. He’s unquestionably the best defender in the D’Backs’ outfield; one can only surmise that his grit and grind numbers (which the Arizona analytics department reportedly keeps strictly confidential) haven’t been quite good enough to earn him a spot in Kirk Gibson’s everyday lineup in the past. In any case, injuries have shoved Parra into a full-time job this season; he’s played in 43 of Arizona’s 44 games. Parra has used his newfound job security to post the best offensive numbers of his career, setting a pace for career highs in walk rate, strikeout rate, and wOBA, while flashing more power than we’ve ever seen from him before. Parra’s hit only four home runs this season, but his 14 doubles rank seventh in the majors. In a hitter-friendly park like Chase Field, a few of those doubles are bound to clear the fence as the weather warms up. If he keeps up this pace (and there’s no reason to think he won’t), he’ll earn all the playing time he needs. With 500-plus plate appearances the rest of the way, Parra has a great chance to post 15 homers and 15 steals alongside a .300 batting average. After slugging 22 home runs in just over 500 plate appearances last season, Allen Craig’s power has vanished. He’s cleared the fence only twice in 172 plate appearances. His previously strong HR/FB has sunk to 27th-worst among qualified first basemen, slightly better than Eric Hosmer, but not quite measuring up to Justin Smoak’s pace. Craig already had six homers by the time last year, and he didn’t play his first game that season until May 1st! Still, I’m not worried. Everything else about Craig looks almost identical to last season. His batted ball rates and plate discipline numbers haven’t shifted in any meaningful way; his batting average and OBP are almost exactly the same as his totals from last year. While he’s only in his fourth season, I feel pretty confident that I know what I’m getting with Craig. His home run total at the end of the season won’t measure up to preseason expectations, but he’s still a good bet to tally at least 15 dingers the rest of the way. Coming off a torn ACL that stole his 2012 season, Victor Martinez was supposed to be the hitter who’d put the Detroit Tigers already terrifying offense over the top. The Tigers do rank fourth in baseball in team wOBA, but Martinez can’t take much credit for that; his .250 wOBA ranks dead last among Tiger hitters with at least 50 plate appearances, behind backup catcher Brayan Peña and backup everything else Don Kelly. Martinez is making contact just as often as should be expected, but those batted balls are finding fielders’ gloves more often than ever before. Martinez hasn’t finished a season with a BABIP under .300 since 2004. His current .225 mark is due more to bad luck than anything else; I’d bet it’ll be at least .290 by the time October rolls around. As the batting average gets better, so will the runs and RBI. Hitting behind OBP machines Prince Fielder and Miguel Cabrera, just about anybody can drive in 70 runs or so. His fading power is a bit more concerning. Martinez’ 3.3% HR/FB rate ranks among the 20 worst in baseball; league leader Justin Upton’s fly balls have found the seats about nine times more frequently than Martinez’. There’s no question that his power has faded as he’s aged, but Martinez is still on pace to hit more than 30 doubles this year, something he’s done in every full season of his career. He’s still got some pop left in his bat, it’s just not enough to crack 20 homers over a full season. Especially in leagues in which he’s catcher-eligible, Martinez is a great buy-low target right now. 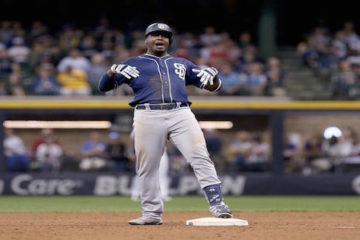 He’ll hit 8-10 homers the rest of the way and provide a boost in batting average, runs, and RBI. This is not just a hot steak. Paul Goldschmidt is not a sell high candidate. He is this good. Ok, he’s not this good, but he’s, like, Top 20 fantasy hitter good. I wrote about Goldschmidt before the season; I thought he’d be good, but I didn’t think he’d reach the power/speed pinnacle for first basemen that Derrek Lee reached in 2003 and Lance Berkman reached in 2008. Goldschmidt continues to sting liners on almost a quarter of his batted balls, but this season he’s hitting more fly balls, clearing the fence on more than a quarter of those. It’s slight jump in HR/FB rate, but based on the consistent power numbers he’s put up at every level, I don’t believe it’s unsustainable. One fourth of a season isn’t enough to say with certainly that a hitter has conquered a previously troubling platoon split, but the fact that Goldschmidt is slugging .629 in 126 plate appearances against righties is certainly a positive sign. Sure, his .383 BABIP will come down a bit, but as we established in the preseason, Goldschmidt is more than capable of maintaining a BABIP in the .350 range over the balance of the season. I still doubt he’ll hit .330, but .300 with 30-plus bombs and 15 steals is absolutely in play.